In this tutorial, you will learn to draw a colorful pirate drawing featuring a fun cartoon character made with basic shapes. Pirates are very popular in movies and books, so why not learn how to draw a pirate that can handle a ship with pride! For this lesson you will need a vector application, a pencil and your drawing abilities! This tutorial is for people with some experience using a vector software. Great! 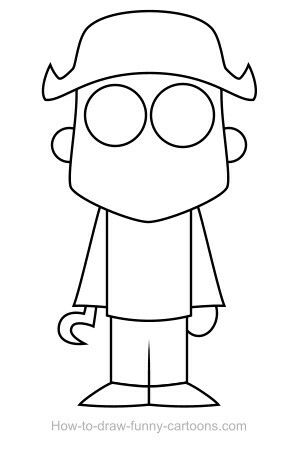 First, we need to sketch the character using simple basic shapes. Just draw two large circles for the eyes and add two more circles for the ears. You can draw one hand using a circle, but the other one must be made with a hook. Feet are drawn with pointed triangles. Make them small if possible. Finally, you can draw a large hat, use a rectangle to illustrate the legs and place a line in this shape to form both legs. It's now time to add details on the illustration. On the hat, you can draw a large skull. A simple one will be perfect. You can also draw a patch on the right eye. 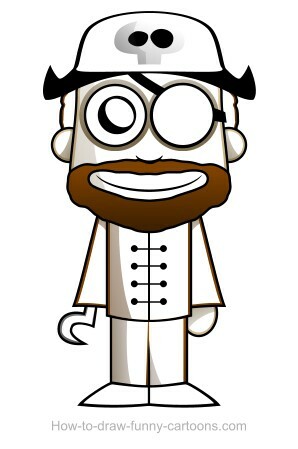 For the costume, using a few simple lines and dots can illustrate a nice outfit. For the mouth, just use a simple curved line and you are done! The nose can also be drawn using a curved line and a large pupil must be added using a circle. Good job! Let's add colors now! For the skin, a simple light tone can be enough. The hat, the patch and the feet can be colored in black. The skull can be colored in white. You can also color the pupil in black. The beard and hair can be colored with a dark brown color. For the outfit, a lighter tone of brown will be enough. 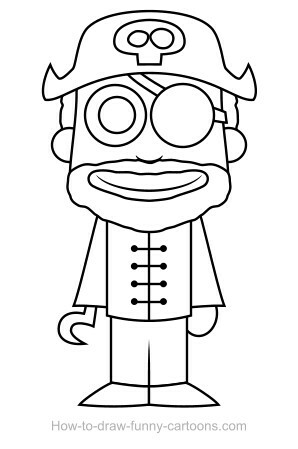 Finally, you can color the hook of the pirate drawing in grey. Now that plain colors are added, let's use a few basic effects to add more depth and volume to the image. Each vector application comes with a simple tool designed to add a second color on each shape already colored with a plain color. By doing so, you can create a simple effect that can literally changed the whole illustration. For the second color, use a darker tone of the color already available in your shape. Your character is now more inviting, more alive and almost seems like it was made with a 3D software. 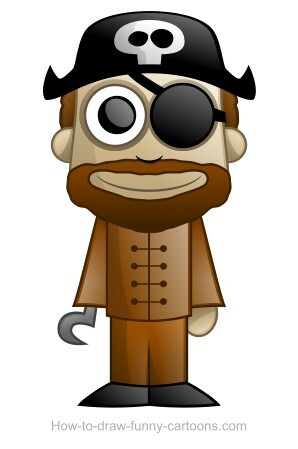 The last step was great, but we need to do more to give the desired effect on the pirate drawing. Draw darker shapes on areas located on the left of the image. You can add these new shadows on the left side of the head, the ears, the eyes, the shirt, the legs and the skull. Be careful not to add too many shadows on the pirate drawing. This one could become harder to read and the result would not be appropriated. These new additions are perfect, but that's not good enough since these shapes are too dark and too visible. Subtle shadows are what we are looking for. Once again, each vector application comes with a tool capable of modifying the opacity of a solid shape. You can use this tool to partially hide all dark shapes. Make sure that each shape is partially hidden on the left side and almost completely hidden on the right side. Now that we have created darker areas to give more depth to the illustration, why not create brighter areas to complete the effect and give life to our character. First, you must draw white shapes on virtually all shapes already available on the cartoon character. Try to draw shapes that are white and slightly smaller than the original ones. You must also make sure that the previous shadows are over these new shapes. Lines drawn previously were created with black outlines. This is nice to create a funny pirate drawing, but if you wish to end up with a more professional result, it might be better to change the color of the outlines.